Official Google Blog: Fireside Hangouts: Join First Lady Michelle Obama in a Google+ Hangout to discuss Let’s Move! and Vice President of the United States have come to Google+ to participate in "Fireside Hangouts" to discuss the challenges the country faces and answer people's questions. On March 4, it's First Lady Michelle Obama's turn as she joins her first-ever Fireside Hangout to discuss Let’s Move!, her initiative to ensure that all our children grow up healthy and reach their full potential. The First Lady will be joined by Kelly Ripa, Emmy award-winning co-host of popular daytime talk show "LIVE with Kelly and Michael," and families from around the country. Three years ago, the First Lady launched the Let's Move! initiative to unite the country around our kids' health and create real support for families to live healthier lives. Since then communities across the United States have worked together to share, collaborate on and create ways to improve the health of our nation's children. 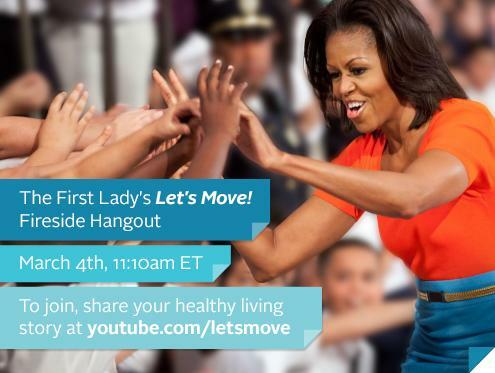 This year, the First Lady is using Google+ to celebrate the anniversary of Let's Move! and to connect with communities on Google+ who are passionate about healthy eating, fitness and parenting. For a chance to join the Google+ Hangout with First Lady Michelle Obama, share your thoughts and questions on raising healthier families and communities on the Let's Move YouTube channel. Submit a video or text entry (video is preferred) telling us a bit about yourself, what your family does to stay healthy and a question for the First Lady by Thursday, February 28, 2013. Then tune in to the First Lady's Fireside Hangout live on the White House Google+ Page or Let's Move YouTube channel at 11:10 am ET on March 4. In the past month, both the President and Vice President of the United States have come to Google+ to participate in "Fireside Hangouts" to discuss the challenges the country faces and answer people's questions. On March 4, it's First Lady Michelle Obama's turn as she joins her first-ever Fireside Hangout to discuss Let’s Move!, her initiative to ensure that all our children grow up healthy and reach their full potential. The First Lady will be joined by Kelly Ripa, Emmy award-winning co-host of popular daytime talk show "LIVE with Kelly and Michael," and families from around the country.